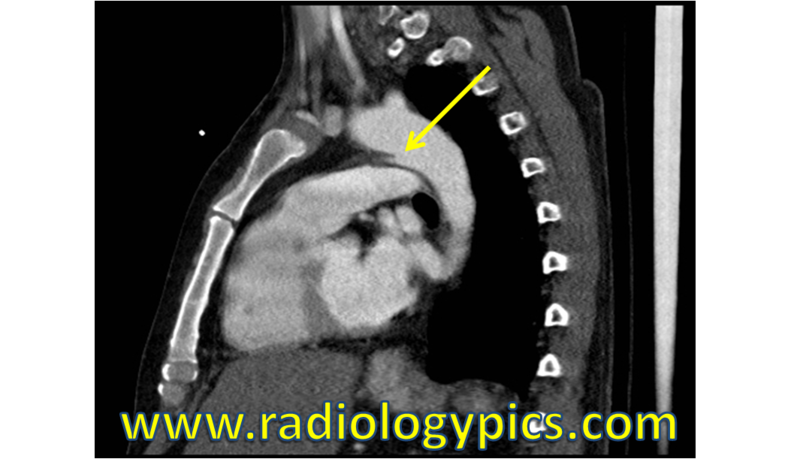 Ductus Diverticulum – Axial CT scan of the chest with intravenous contrast reveals a focal outpouching of the descending aorta at the aortic isthmus (yellow arrow), compatible with a ductus diverticulum or ductus bump. 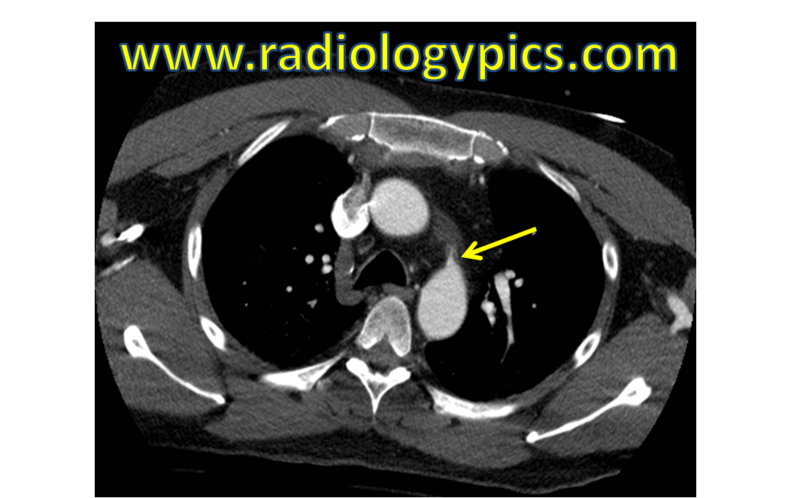 Ductus Diverticulum – Sagittal CT scan of the chest with intravenous contrast reveals a focal outpouching of the aorta at the aortic isthmus (yellow arrow), representing a ductus bump or ductus diverticulum. This is a good example of a ductus diverticulum, or ductus bump. A ductus diverticulum is a focal smooth outpouching of the aortic wall at the aortic isthmus where the obliterated ductus arteriosus (the ligamentum arteriosum) is attached to the aorta. The ductus diverticulum is a normal finding and is present in approximately 9% of adults on aortograms. It is a mimicker of post-traumatic pseudoaneurysms which classically happen in high speed motor vehicle accidents. The differential diagnosis for this appearance includes a ductus diverticulum, a psuedoaneurysm, ulcerated atherosclerotic plaque, a diverticulum of Kommerell, and a true atherosclerotic aneurysm. An excellent article explaining aortic wall abnormalities can be found here. Thanks to Justin Tan, M.D. for this great example of a ductus diverticulum. Thanks this is what i’ve been looking for!